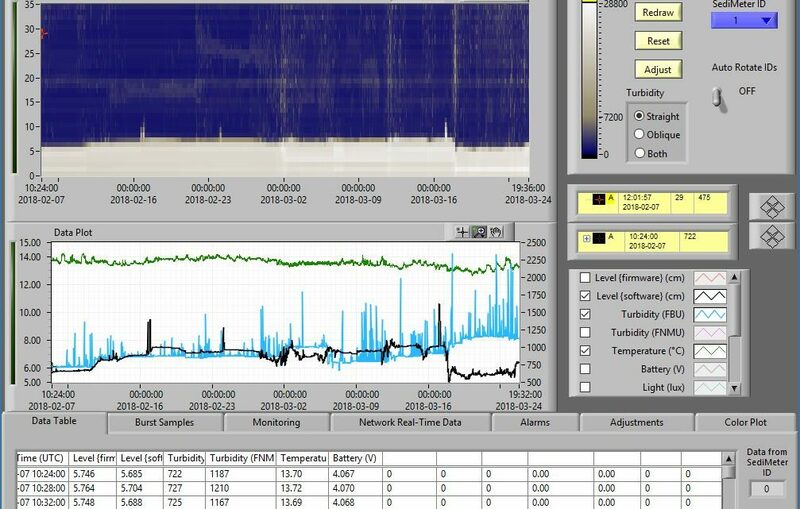 SediMeter Demo Data File • Lindorm, Inc.
Several users already have third party loggers and want to use them to bring data ashore in real time. The slave monitoring function allows the importing of files from third party loggers to the SediMeter software. The third party logger will download the raw data to an *.ld2 file, and the SediMeter software will read the *.ld2 file, display it, and act as a web server. This means that the data can be published to the Internet in real time using our graphical interface. Many instruments can be monitored at the same time, and the window can automatically rotate between them. The main change in 4.1 compared to 4.0 is, however, in the way the user interacts with the software. The Control window is no longer the nerve center for data. Rather, all activities related to analyzing data, opening, importing, editing, saving, and real time monitoring is done from the Data window. The Control window only retains the functions for communicating with the SediMeter instrument.